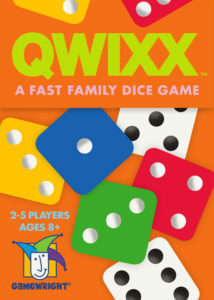 Qwixx is a dice game using four colored dice and two white dice. The game, designed for two to five players, is a race to accumulate the highest score while locking out sections of the scorepad. 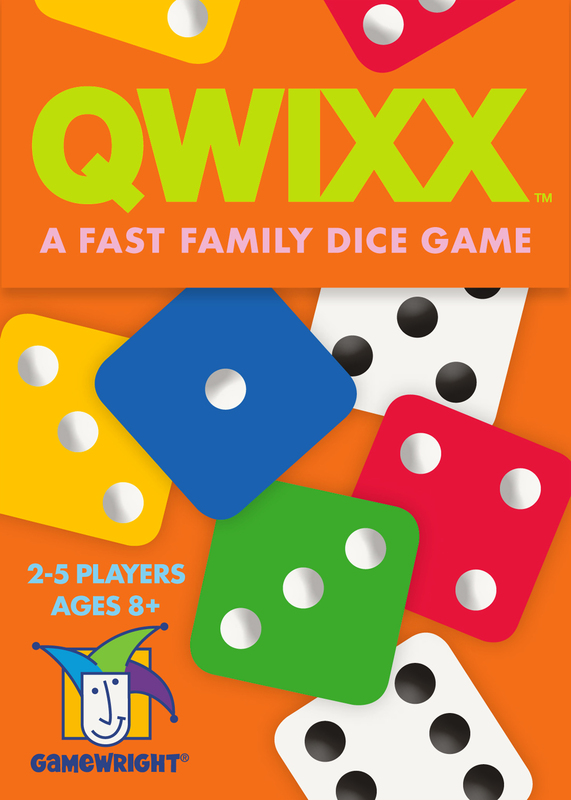 Because the Qwixx rules are simple, this is a family-friendly game designed for players eight and up. The underlying rule in Qwixx is that numbers must be crossed out from left to right in each of the four colored rows. They do not have to be crossed out sequentially, but once you choose a number in the row to cross out, you can’t go back and cross out numbers before it in the row. It can be helpful to designate this by drawing a horizontal line through the dead spaces on your scorecard. Roll dice to determine who goes first–high roll wins. Play begins with the active player rolling all six dice. The active player then announces the sum of the two white dice. All players may then cross out that number from any one of the colored rows on their scoresheet. Players do not have to cross out a number if they do not want to. The active player then adds the sum of one white die and any one of the colored dice. The active player (only) may then cross out that number on the corresponding color row on their score sheet. The active player may elect to not cross out this number. If after both actions on the turn, the active player has not crossed out at least one number, they mark an “X” on a penalty box, which will reduce their score at the end of the game. Play continues in this manner for all players. If a player wants to lock a row by crossing out the number at the extreme right, they must first have at least five numbers in that row and have a sum that matches the number furthest right. The player also crosses out the lock on that row, which will count toward their score later in the round. Once the row is locked, players can no longer cross out numbers from that row during play. Remove the die that corresponds to the color of the locked row from the game. According to the Qwixx rules, the game ends when one player crosses off their fourth penalty box on their scoresheet or two of the dice are removed from the game (two rows have been locked). Beneath the four colored rows on the scoresheet is a table that lists the amount of points scored per “X” on each row. Add the number of “X’s” in the row together and write the corresponding number in the blank space on the score pad. Remember that the “X’s” on the image of the lock count toward your total. Repeat this process for all four rows. Finally, subtract five points per penalty “X” from the total score. The player with the highest score wins the round.